Celastrus is prized by native peoples throughout India for its seeds, which grow in round pods that gradually change from a light yellow to a deep red color as they mature. The seeds are small, oval shaped and grow six per seedpod. 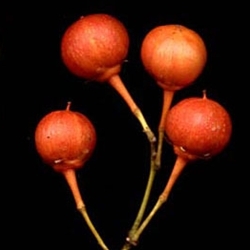 We offer these non-Viable, pasteurized seeds as an herbarium specimen only.